Following an investigation, the Arabian Horse Association has cancelled the Certificate of Registration for the following two horses on the grounds that neither of the horses were the subject of the Certificate of Registration issued. So Big Boy 669936 owned by Mark Powell, raced under Powell Boys Stable and trained by Scott Powell. Bigg Girl 676161 owned by Mark Powell, raced under Powell Boys Stable and trained by Scott Powell. The Arabian Jockey Club can state that the horses presented as So Big Boy and Bigg Girl did not qualify via DNA test as offspring of the dam identified on their Certificates of Registration. Both horses qualified via DNA test as offspring of the sire identified on their Certificates of Registration. 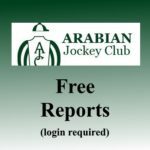 The Arabian Jockey Club has no information to suggest that the purebred status of the reported sire and either reported dam is in question; however, DNA testing confirmed that the reported dams are not the actual dams of the two horses in question. The Arabian Jockey Club recognizes that further proceedings and actions may result from the cancellation of these Certificates of Registration but cannot and will not speculate about those outcomes. The Arabian Jockey Club will endeavor to report those outcomes as they become known. This unfortunate incident is limited to these two horses. It is very sad that our entire racing community has been under a cloud as a result. The Arabian Jockey Club and the Arabian Horse Association is dedicated to the integrity of racing and the Arabian horse. The new requirements for obtaining a Certificate of Racing to include a second DNA test and microchipping, as well as continued random DNA testing, will help to ensure this never happens again.